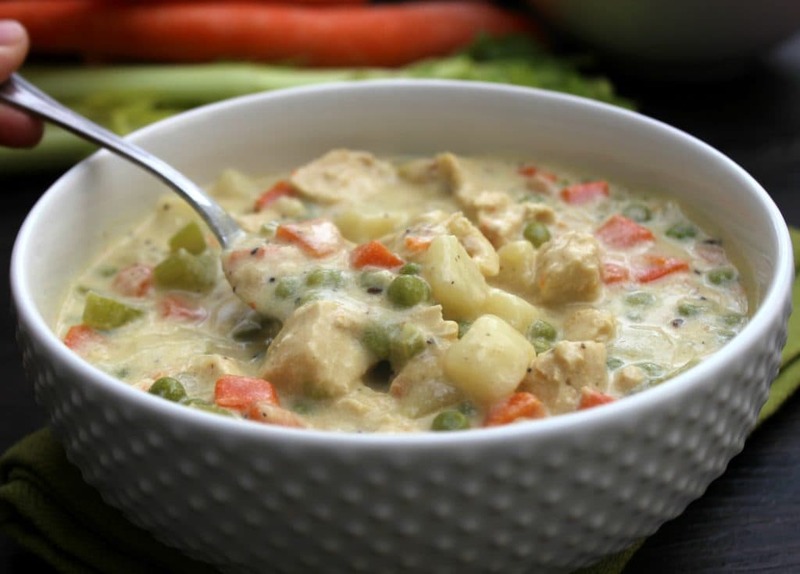 CHICKEN POT PIE SOUP – a deliciously simple soup recipe made from scratch. A fantastic classic comfort food brought to you in a bowl. This Chicken Pot Pie Soup is a super simple, staple comfort food! It’s awesome during the cold fall and winter months, I love cozying up with a bowl during the chilly holiday season! I am a huge fan of soup in the fall and winter months, wait actually all year long. And typically I have a soup I stick to for the season, like summer we do a lot of my Authentic Chicken Tortilla Soup and for fall and winter, I stick to this CHICKEN POT PIE SOUP. I can’t even really begin to describe how amazing this soup is; creamy, warm and just full of comfort. And guess what you really don’t even miss the crust from the chicken pot pie, seriously. Seriously, people, you have got to try this. It is oh, so good and will not disappoint. 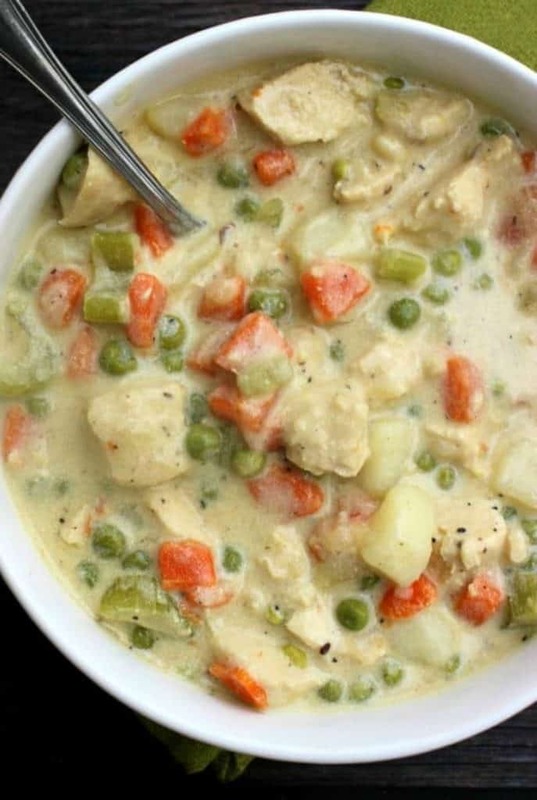 How do you make Chicken Pot Pie Soup? Bring a large pot of water to a boil, once water is boiling add in potatoes and cook until tender. Strain potatoes from pot and set them aside in a bowl. In a large pot, over medium to high heat add butter, once butter has started to melt add in carrots, cook for 1-2 minutes, then add in onion and celery, season vegetables with 2 teaspoons of Montreal Steak seasoning. Add in water and chicken base, bring is a boil. Let it cook over medium heat for 10-15 minutes. In a water bottle or cup with lid add ½ cup of ½ & ½ with the flour, shake vigorously. Add in the remainder of the milk to the pot and then add in flour mixture. Add in frozen peas, potatoes, and cubed chicken, season with salt and pepper and add an additional 1-2 teaspoons of Montreal Steak seasoning. Let it simmer 30 minutes until the soup starts to thicken. 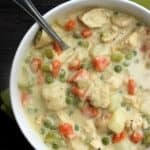 My favorite kitchen items to make this CHICKEN POT PIE SOUP are below, you will want of few of these just for your everyday cooking. 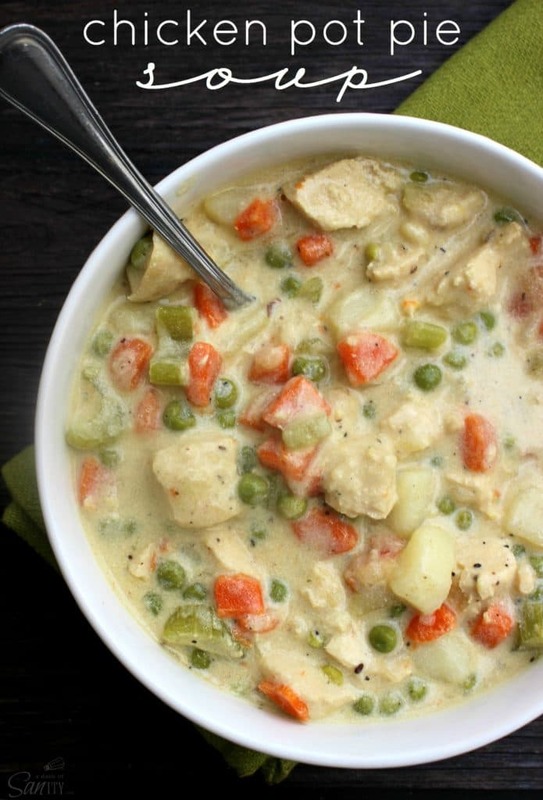 Don’t forget to pin these CHICKEN POT PIE SOUP to your favorite Pinterest board for later. This recipe was first post in October 2014.
how much flour? I don’t see it in the ingredients. Thanks. Sounds wonderful for cold winter nights. I was wondering if instead of thickening with flour I could use small dumplings and would they thicken it enough. Thanks for recipe, sounds and looks delicious. On main page of ingredients it says 2 Tbsp. This looks so tasty. I am planning this for this weekend. Can’t wait. This sounds and looks so delicious. I love Chicken Pot Pie and this looks equal delicious. Putting it on our weekly menu for next week. Can’t wait to try it. Thanks for sharing your friend’s recipe! This looks super yummy! Pinning, so I can make this for the family this winter. Visiting from Create Link Inspire. Thank Emily, this made my day. This looks amazing and PERFECT for the weather we have today! Thank you for the secret ingredient, too. 🙂 I’ve pinned it, shared it on facebook, and my family will be testing it soon. Sandra this looks so good! I love soups this time of year and this one looks so comforting. Thanks so much for sharing this at the Project Parade! 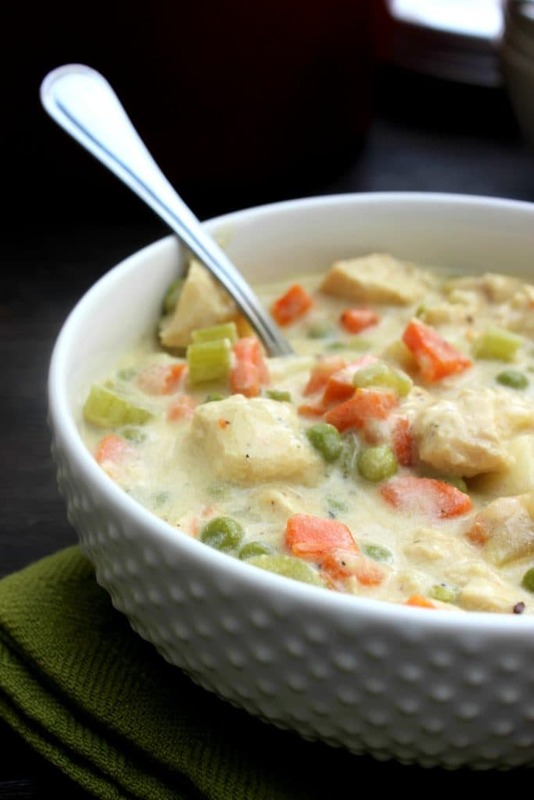 I love chicken pot pie for it’s comfort food factor as well, and I love that you turned it into a soup! Thank you so much for linking up at Tasty Tuesday! Your recipe has been pinned to the Tasty Tuesday Pinterest board! Please join us again this week! This looks so wonderful! Love chicken pot pie. Pinning! I make homemade pot pies and have thought often that I should turn it into a soup recipe. Thanks so much for sharing yours. Pinning! This sounds wonderful. I’m going to serve it with homemade biscuits on the side instead of crackers. That would really taste like chicken pot pie. My mouth is watering thinking about it! Thanks for this awesome sounding recipe. I made this tonight and it was delicious!! A bit salty so next time I’m only using about 2-3 tsp total of the Montreal Seasoning. That combined with the chicken stock seems to be a lot of sodium. Which don’t get me wrong….I love my salt but I’ll make a bit of an adjustment next time. Also I took a store bought pie crust dough and put it on a cookie sheet. Sliced it with a pizza cutter into short strips and dusted it with some poultry seasoning and a bit of salt and baked it until golden…about 6min. (put it on parchment) Topped the soup with some of those and it made it even more like Pot Pie. 🙂 Thanks for sharing this recipe….a definite keeper!!! That is how I have had it also, with chunks of some type of pie crust on top and a little mixed into the soup. It must have been added at the end of cooking so it wouldn’t dissolve completely. Delicious!!! Can this be made ahead and frozen? thanks! I’m pretty sure I could eat like three bowls of that! Yum! This was fabulous! Just finished making it an hour ago, and I’ve already had two bowls for dinner! Thanks for sharing the Montreal Seasoning tip! I would never have thought to use this in soup! Now what else can I use this in? Nice blog! this blog very useful for everyone i like your post. anne’s Dumplings provide food service. Any idea how to make this in the crock pot? So glad I found your site! I was looking for a good chicken pot pie soup recipe to try, and made this for dinner last night. My husband and two year old daughter loved it and we just had great leftovers for lunch too. I’ll definitely make this again, and I’ll only use three tbsp of seasoning to make it more kid palatable (but never bland! )Thanks for posting this, it was a hit! You can find chicken base in your local grocery store typically above the chicken broth it comes in cubes or a powder form. Does this help? Made this for the family and they loved it!!! Begging for more!! Thus looks so yummy making right now but don’t have,any Montreal Steak seasoning would I be able to use Season All or Emeril ‘s Original Essence instead? Made this tonight and it is soooo tasty. I mainly made it because I had leftover heavy cream from breakfast and 2 cups of chicken broth from another recipe I was sitting on. Luckily, I came across your great recipe! Super yummy on a day the weather got colder in New England. Thanks for posting! Instead of heavy cream could I use lactose free milk? This was Delicious !!! I served our soup in a bread bowl – it was amazing !!! Thanks for a great recipe. What is the “chicken base” that you are supposed to add? I’ve made this a few times now, everyone just loves it! Any suggestions for making this into a slow cooker soup to come home to after working? This sounds delicious and can’t wait to try it! yes, add all ingredients to crockpot, add enough water, and turn on. boom. Its the middle of summer, but I saw this recipe and wanted to try it. I didn’t have chicken base so I used the stock the chicken cooked in as well as some extra chicken stock I’d had left over. At the end I added some Bisquick drop dumplings. This was amazing. Very hearty and was a snap to make after work. I will definitely be using this recipe many times again. Thank you for sharing. Great warming meal for the fall and winter! It can be tweaked for those with Celiac or gluten sensitivities or dairy allergies. My family can’t quit raving about this soup! The kid just gave me two big thumbs up! I’ve made this twice; a double batch then a quad!!! Followed the recipe closely and it’s one the the most unique and impressive tasting soups I ever made! What a perfect blend of ingredients; I’m amazed how much the Montreal Steak Seasoning adds to the flavour profile! Excellent recipe Sandra, thank you so much for sharing! I absolutely LOVE this recipe, I’ve served it so many times and there’s never leftovers regardless of the amount made. It’s just impossible to resist. With that said, I was wondering if this is possible to make in a crock pot, and if so any ideas on how to go about it? Add all ingredients besides the flour mixture, the chicken and potatoes and cook on low for a few hours, then add the them at the end? Or add the flour mixture as well as the chicken (perhaps raw?) and then cook for a few hours, shred when you add the potatoes? I love chicken pot soup. Is amazing and not expensive at all to make. Yes you got it – there is a powdered cube version and the base is more like a creamy base – like a peanut butter like texture – I prefer this over the dried cubes but you could use either. Just need to know what is Montreal Seasoning? Montreal Steak Seasoning – you can find it in the seasoning aisle. It’s over in the spices by the steak sesonings. Wonderful flavorful blend. to celebrate winning four Stanley Cups in a row, the Montreal Canadians created a seasoning that would later be named, Montreal Steak Seasoning. I love this soup recipe. I can’t wait to try it this fall!!! So excited soup season is coming! Do you have a carb count for this recipe? It was featured in a list of low carb soups. Thank you. My husband raved about this one! We loved this! I think it is better than pot pie and way less work. I added the potatoes with the water and they cooked just fine along with the rest of the soup.